If you’ve ever wanted to visit a spa or salon for a microdermabrasion, but have been shocked at the price of one treatment, you have to check out this facial scrubber. One facial treatment in a salon would never be enough. To really see noticeable results from treatments, they recommend more than one visit. 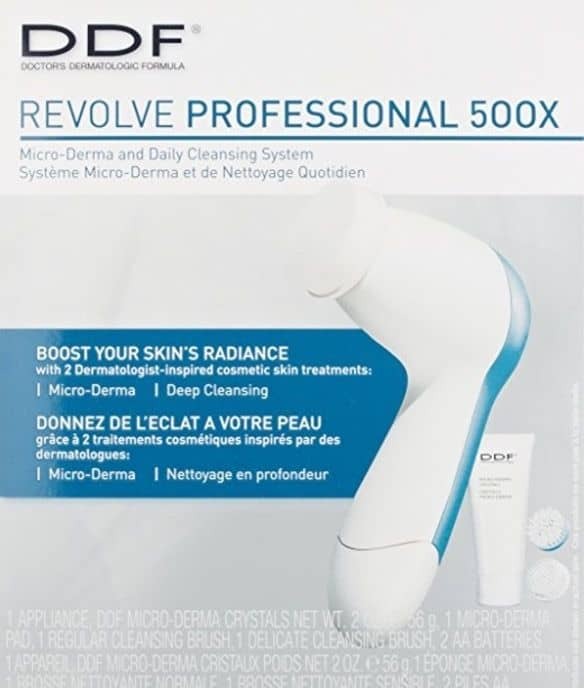 With the DDF (Doctor’s Dermatologic Formula) Revolve Professional 500x, you spend less than you would for one visit to the salon and have a complete system that includes daily scrubbing as well as weekly microdermabrasion treatments. 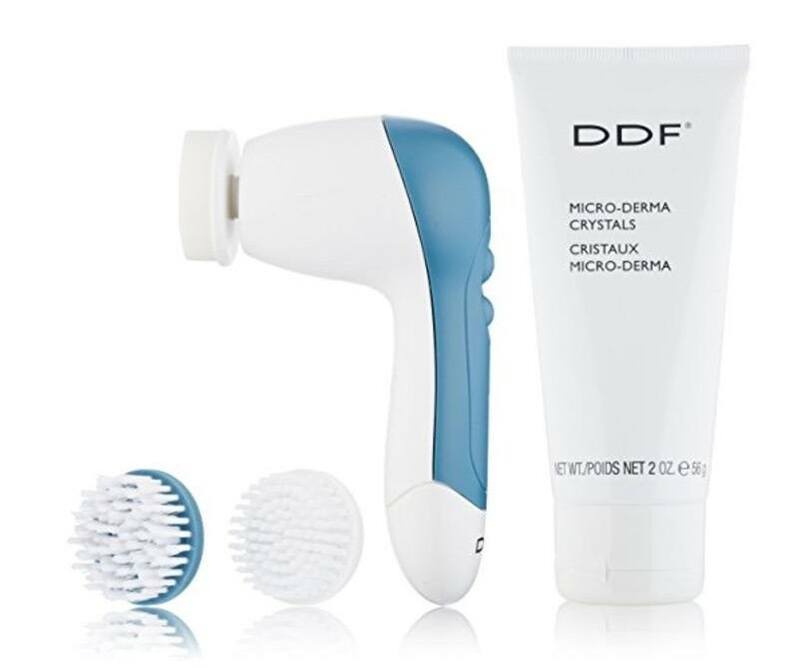 The DDF machine comes with the handheld unit as well as two brushes for daily cleansing. There’s a simple brush for delicate skin and one for normal skin. The kit includes the microderma pad as well as the abrasion crystals for gentle resurfacing of the skin. The daily cleansing system involves the rotating bristles and the cleanser of your choice. You’ll be able to choose the speed and intensity that works best for your needs and skin. For some, the 300x or slowest setting works best while others want the intense 500x rotating speed. You might need some time to test out the settings for yourself, but it’s likely that you’ll find the speed that works best. The microdermabrasion pad and crystals work together to give your skin a gentle resurfacing. While you’re not getting the depth that you would in a salon, you’ll be able to do this once a week to work up to a gradual refinement in the skin. The pad is good for 4 months of treatments before it would need to be replaced. When you are washing your face by hand, you’re simply not going to be able to get your skin as clean as if you were to use a facial scrubber. This scrubber has two different brush heads for sensitive and normal skin, which means you can change out the brush heads depending on the part of the face you’re washing, too. This kind of customization is fantastic for those with sensitive skin as well as those with varied skin types on their face, which is most people. The T-zone often needs a deeper cleaning than the cheeks or around the eyes. Along with the scrubber, it’s like a bonus to get the extra pad and crystals for the microdermabrasion. It allows you to get deep into the skin. While some crystals and pads are causing microscopic cuts and scrapes, this is using crystals and a circular motion to brush away the skin cells. It’s less destructive to the skin on your face. When you receive the facial scrubbing system, there’s no need to charge it. It comes with batteries, so you’ll need to install the batteries for the device. Attach the softest brush to the unit and run it under warm water. You’ll want to rinse it slightly before use. Wet your face and apply your favorite cleanser to the brush. The brush will rotate, so you’ll only need to move the brush gently around your face. After using the softest brush, determine whether you’d like deeper cleaning. Next time, use the normal brush on your face. You don’t want to start with the normal one until you estimate your skin’s reaction to the system. The manufacturer as well as other users of the product suggest using the softest setting twice a day. You don’t want to press down heavily on the brush to remove healthy skin cells, but you do want a deep cleaning that gets into the pores. Always remove eye makeup by hand before using the brush and never use on the eyes. For microdermabrasion, it’s recommended that it’s only done once a week. Any more than that, and you’ll end up with irritated skin that will see the removal of your fresh, healthy layer of skin. It’ll cause rashes and problems with the skin instead of relieving skin issues. Using a cleansing system gives you smoother skin as well as brighter and more even skin tone. Some users have said they no longer need a heavy base makeup to even their skin tone. They’re able to use a tinted moisturizer instead. At the very least, you should be able to add this to your beauty regime and see noticeable improvements in your skin. Your face will absorb moisturizer better, which also gives your face an incredible glow.